Hill Street hit home nine goals to romp to victory against Riverdale by 9-2. Ian Penny’s third successive hat-trick proved the highlight - part of four goals overall - with the in-form forward kicking off the scoring with a slick finish. Alex Glenn doubled the tally then Penny wrapped up his personal treble either side of a Riverdale finish. Ashley Gregg shared the matchball with Penny thanks to a second-half hat-trick on the way to the 9-2 triumph. 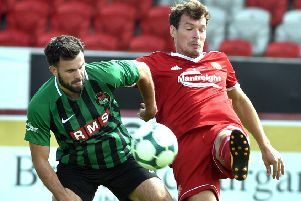 Derryhirk United extended the unbeaten start to the league season with a 4-2 defeat of The Ambassadors. It proved a thrilling clash in Portadown, with Dean McGuigan impressive in midfield for the visitors and Ciaran Magee firing home the first goal. Michael Hagan worked hard to close down an attack by The Ambassadors and capped his efforts with the afternoon’s second goal. It was 2-1 early in the second half but Sean Morrow celebrated his debut with a superb individual effort. Conor Magee produced a superb save and Fergal Moore added to the Derryhirk tally towards the 4-2 success. Magee, Michael Hagan and McGuigan proved the pick of the Derryhirk squad. MID-ULSTER INTERMEDIATE LEAGUE SECTION A: Crewe United 0-0 Newry City AFC; Fivemiletown United 1-1 Seapatrick. MID-ULSTER INTERMEDIATE LEAGUE SECTION B: Dungannon Rovers 1-6 Moneyslane; Lurgan Town 1-2 Dungannon Tigers. MID-ULSTER LEAGUE DIVISION ONE: The Ambassadors 2-4 Derryhirk United; Cookstown Celtic 6-0 Lurgan Institute; Red Star 3-1 Coalisland Athletic; Riverdale 2-9 Hill Street; Sandy Hill 2-3 Ballyoran. MID-ULSTER LEAGUE DIVISION TWO: Glenavy 5-1 Knockmenagh Swifts. MID-ULSTER LEAGUE DIVISION THREE: Armagh Blues 3-6 Aghalee Village; Hillsborough Boys 1-6 Caledon Rovers; Newmills 2-2 Lurgan United; Union Lusa 3-6 White City. MID-ULSTER LEAGUE DIVISION FOUR: Lurgyvallen12 2-1 The Dons; Millbrook 4-3 Santos; Southside 4-4 Damolly; West End Hibs 3-4 Banbridge YCOB. IRISH CUP (ROUND THREE): Ards Rangers 4-1 St Mary’s; Immaculata 4-2 Lower Maze; Lisburn Rangers 3-0 Tandragee Rovers; Trojans 5-1 Banbridge Rangers; Valley Rangers 0-2 Wellington Rec. MARSHALL CUP (ROUND THREE): Donaghmore 2-3 Windmill Stars; Rectory Rangers 4-1 Keady Celtic; Silverwood United 5-1 Ballymacash Rangers. MUFL RESERVE CHAMPIONSHIP: Coagh United 2-0 Dollingstown. MID-ULSTER RESERVE LEAGUE DIVISION ONE: Craigavon City 3-2 Lower Maze. MID-ULSTER RESERVE LEAGUE DIVISION TWO: Ballyoran 5-3 Portadown BBOB. MID-ULSTER RESERVE LEAGUE DIVISION THREE: Banbridge Town AFC 2-4 Donacloney; Tullyvallen 2-2 Rectory Rangers; Valley Rangers Swifts 7-0 Red Star. MID-ULSTER RESERVE LEAGUE DIVISION FOUR: Aghalee Village 4-2 Newmills; Southside 1-2 Windmill Stars. WILMOR JOHNSTON MEMORIAL CUP (ROUND ONE): Armagh City 3-3 Newry City AFC (Newry win 5-3 on penalties). O’HARA CUP (ROUND TWO): Donaghmore 1-4 Valley Rangers; Dungannon Tigers 5-2 Goodyear; Silverwood United 3-2 Seagoe.